Do you like it? It feels clean to me, and I like clean things. Unless I accidentally spill tea all over it or drop it in the mud, I expect to make it Pandemonium's new permanent residence. Please find office rules below. Read in full and sign your name on the line below. 1. There will be no stomping of feet. No whistling. No loud typing. No slurping of liquids or audible chewing of food. I do not want to hear you breathe. 2. Keep your stuff off my desk. That includes papers, network cables, USB cables, power cables, any other cables you may have in your possession, writing instruments, dust, and the office telephone. 3. Keep your hands off my headphones. 4. Do not sniff. Ever. 5. Periodically acknowledge my presence, but do not make constant demands on my attention. I would appreciate cupcakes on my birthday. Carrot cake on odd years and red velvet on even years. 6. Your mobile phone stays at home. 7. If you are ill, you are prohibited from entering the office until you've been free of symptoms for 48 hours. Please arrange to have housekeeping bleach your desk, the bathrooms, kitchen area, and all office doorhandles in your absence. 8. Do not usurp my efforts to keep the room temperature above 24° C.
Actually, never mind. I have come to the conclusion that my ideal officemate is a cat. Please go away now. First, there was the flu. The kind that creeps up on you as you're waiting for your flight home and won't be deterred by long-awaited hugs from the Parental Units, chicken fingers, or even my usual standby - pretending it doesn't exist. The flu put a damper on my first days in Kars. There were things I needed to do - visit with Grandad, bake cookies with my mom, take an ice pick to the driveway - that I could not do, because I was busy lying in a shivering ball on the couch wondering when the telltale signs of the plague would begin. Then there was the ice storm and accompanying power outages. Out of everyone in Eastern Canada, I probably suffered least; first, because I love a good winter storm, second, because our longest period without power was only eight hours and we had the woodstove to keep us warm, and third, because I still had the plague and was therefore off de-icing the driveway duty. Christmas Day rolled around, and things started looking up. Mom and I decided that we'd only had the flu, not the plague, and the sun came out and turned the Belleisle into a dazzling kaleidoscope of icy splendor. While Mom cooked the turkey, Dad and I drove into Saint John to visit with the town relatives in Grandad's hotel room, which, unlike his house, had lights and was not 2 degrees. Then there were some brilliant days of the sort I'd been waiting for all year. One morning we hiked to the ice caves. Another day, my mom and I explored the trail through Ducks Unlimited, which, in summer, is all forest and marshes and not far from where certain members of the family have gotten almost-irreparably lost while kayaking. We went on drives to investigate frozen-over waterfalls and look for snow buntings. I did, eventually, get to shovel snow. We drove to Fredericton so that I could get my new passport. At least, I think it was Fredericton. It was hard to tell from the little that was visible over the 6-8 foot snowbanks. The cold set in during my last few days. The kind of cold that makes the snow squeak under your boots and drains all the heat from your body within seconds, even if you're wearing your thickest sweater and warmest mitts. The pipes froze a few times and Dad started worrying about whether the firewood was going to last the winter. I was quite happy to wake up and see the thermometer approaching -30, that being rather outside the range I've experienced in recent years. It was bitterly cold on my last day, but I sucked it up and went outside to do a bit of car-sweeping and shovelling. A girl's got to do these things while she can. Once I'd lost feeling in my fingers and toes, I figured it was a good time to go for a bit of a walk on the bay. 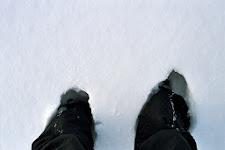 I took this picture of my snowshoe tracks the next morning, just before we left for the Moncton airport. There were only a couple things I would have changed, in the end. It would have been nice if the other Bishop piglets could have been there, but that wasn't possible this year. I could have done without the plague, even though it was only a flu, because it reduced the time I got to spend with Grandad. Also, it made my mom miserable after I gave it to her, and she's a nice lady who doesn't deserve to be miserable. Ideally, I would not have had my DVD drive die halfway through converting my CD collection to iTunes files, because that caused my Dad a lot of extra work, and he's a nice man who has better things to do with his time, like stock the fire and eat rumballs. Ultimately, it was a trip that avoided being disastrous by virtue of being awesome.